At last count, Etsy featured roughly 850,000 shops. Don’t worry, though: The items in these shops are displayed in browse pages, which are organized by broad themes — nine, to be exact, plus a few extra seasonal pages or trending items — so you can easily find what you’re looking for. The themes include Art, Home & Living, Jewelry, Women, Men, Kids, Vintage, Weddings, and Craft Supplies. 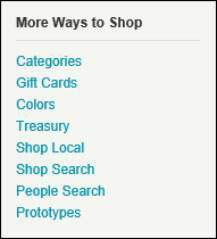 The extra pages are Trending Items, Mother’s Day Gifts, Spring Celebrations, Gift Ideas, and Mobile Accessories. Clicking a theme (on the left side of the home page) reveals a browse page featuring items in that theme, along with several clickable subcategories to help you narrow the field. The Handpicked Items section of Etsy’s home page features goodies assembled into a Treasury list by a fellow Etsy user. Etsy staffers then pluck this Treasury list from obscurity and plant it front and center on the site’s home page. Often these items, which change several times a day, center on a particular color, style, holiday, or theme. 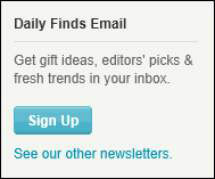 If you want to receive Etsy’s daily e-mail that’s chock-full of goodies for sale on the site, click the Sign Up button under Daily Finds Email. Click the See Our Other Newsletters link to sign up for additional newsletters, such as Etsy Fashion, Etsy Weddings, Etsy Dudes — the list goes on. Etsy offers several tools to enhance your shopping experience, located in the More Ways to Shop area of the site’s home page. Etsy sells gift cards in a variety of denominations — $25, $50, $100, and $250. To buy one, you can click the Gift Cards link under More Ways to Shop, in the same way you can click the Gift Cards link above the Etsy header bar. If you’re looking to find the perfect bejeweled complement for your chartreuse-hued smoking jacket, check out Etsy’s Color tool. With this tool, you simply click a color on the palette to view random items for sale in that color. When you list an item in your Etsy shop, you can apply a “color” tag to it. So, if the item is predominately puce, you can add a “puce” tag. Etsy’s vast community of members is a great resource for finding amazing items for sale on the site. To tap into this community, visit the Etsy Treasury. There, you’ll find what Etsy describes as an “ever-changing, member-curated shopping gallery” composed of lists of items. Everyone knows how important shopping local is. For starters, it keeps money and jobs in your community. In addition, because the seller ships your item only across town instead of across the country, buying local blunts your impact on the planet. It likely comes as no surprise that an organization like Etsy is hip to the whole “shop local” thing. Its Shop Local feature displays the most recently updated shops in your area. With Shop Local, you can find — and buy from — Etsy sellers right in your hometown. Just enter your town and state in the search field (if it’s not pulled automatically from the info you supplied to Etsy when you signed up for an account) and what you’re looking for. Easy! To ensure that your shop appears in Shop Local, you must enter your hometown in your user profile. Suppose your neighbor just opened an Etsy shop, and you’re dying to check it out. The only problem is, you forgot what she named her shop! 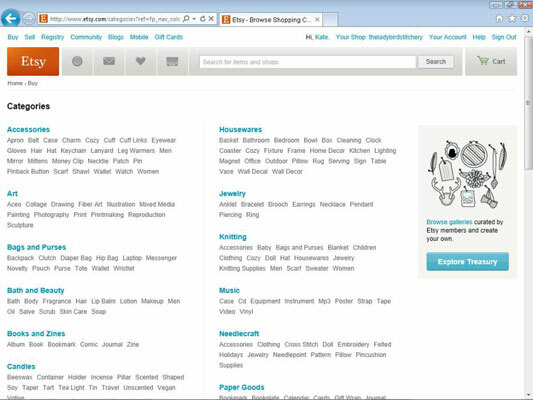 Fortunately, Etsy enables you to search for other members on the site — shop owners and non–shop owners alike. Simply click the People Search link under Ways to Shop, type the name of the person you seek, and — voilà! — Etsy returns a list of members with matching names, with links to their profiles and shops (assuming they have one). Your guess is as good as ours as to why Etsy included a link to its Prototypes program under Ways to Shop. But if you’re interested in joining an Etsy Prototype, you can access them by clicking this link. Every two days or so, Etsy staffers introduce a new featured shop — one that displays ingenuity, sells well-made items, and populates each listing with interesting descriptions and top-notch photos. The featured shop appears on Etsy’s home page, with a link to an interview with the proprietor of that shop and to item listings in it.